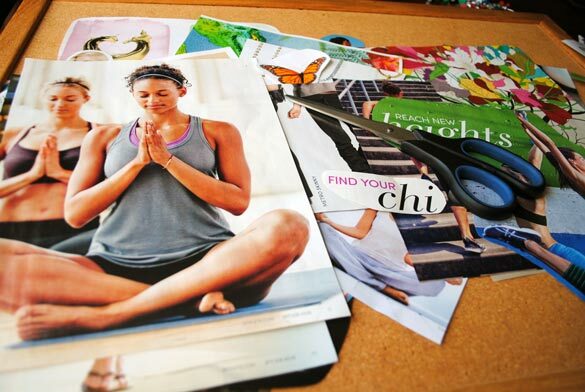 One my favorite January traditions — and it’s part of the January Fit Bottomed Challenge — is creating a dream board! 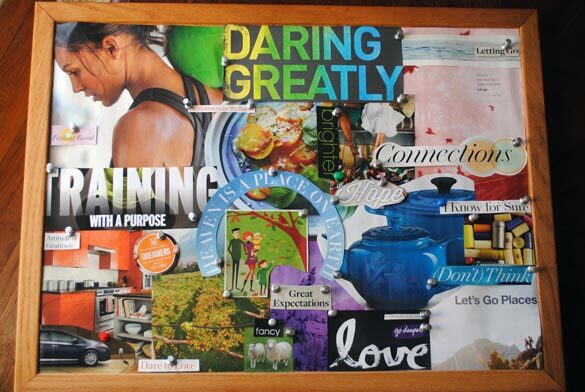 I’ve jabbered about how to make a dream board before, but I was so darn pleased with last year’s results and so jazzed about my new one that I just had to talk about it again. I know dream boards are a little hippity dippity, but, guys. They are fun to do, get you dreaming and feeling good, and THEY WORK. 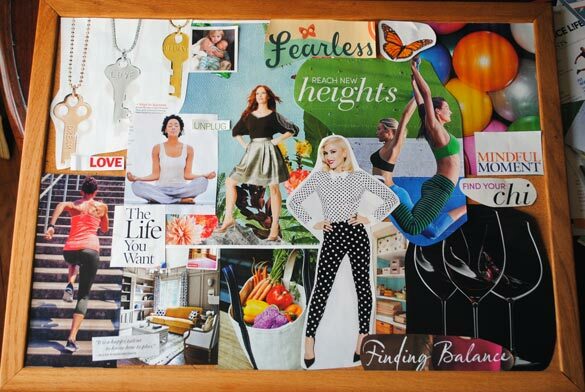 My fertility struggles have been no secret, and last year’s dream board was, of course, about having a family, but it was also centered on a lot of personal things I wanted to work on. Or, actually, not work on. Namely, I wanted to give up control, trust my instincts and my body better, and not just hope for the best but expect it. I didn’t just want to work out; I wanted to be more aware of my body. And, you know, I also wanted a nicer kitchen, good wine and to be surrounded by sheep. And that pretty much all happened. I learned to let go and trust. I strengthened relationships and connections with friends and family. My workouts certainly got a purpose. I upgraded some of my cooking gear and we revamped the kitchen a bit. I went on some great adventures (to Cali wine country for fabulous wine, Seattle for Brooks Running and Colorado for hiking!). We bought a new car (that’s freakishly the same color you see in my dream board). I got my sheep. And, best of all, we were blessed with the little girl we’ve been waiting for. I’ve been doing dream boards for going on 10 years now, but this one took the cake. And it made me even more jazzed to do a new one for 2015. New adventures! New goals! New person! New role! 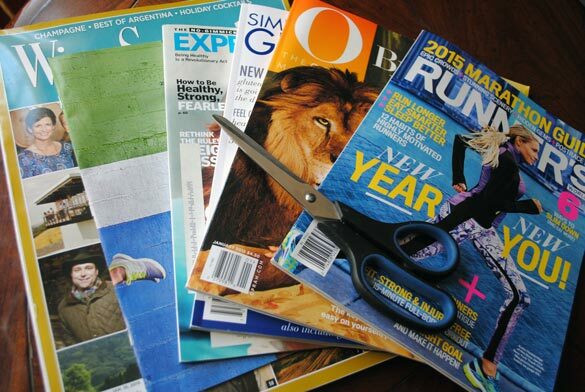 I tried to pick a variety of magazines with inspirational and inspiring to choose from this year, but it seems I always end up with at least a few on running, working out, wine and, of course, O magazine. And then the cutting began! I don’t spend much time thinking about what I select. It’s really just whatever speaks to me or I think is pretty/cool. Then, a few days later, I cut out those images and phrases that really speak to me, editing down my choices a bit further. Then, I put on some good tunes and get to placing them! I’m not an overly crafty person and my art skills peaked in, oh, the second grade (no, seriously, I won an award for a drawing of a cow and I swear that’s still the cow I’d draw today — with practice), so I don’t stress about where to put what. I just do what feels right and what looks good to me. 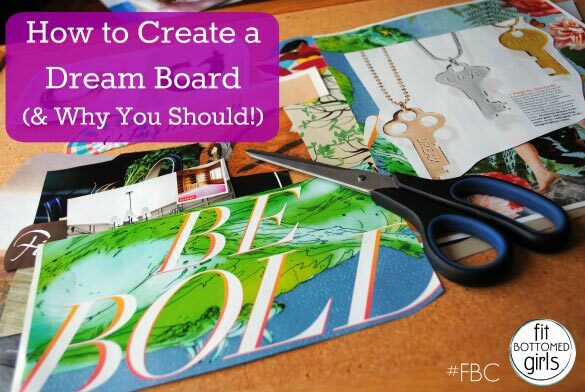 The best thing about a dream board is that it’s only for YOU. So if you dig it, that’s all that matters. And here was the final outcome! Talk about some girl power, eh? There are beautiful and unique women striking a pose (polka dots! ), being bad asses (pull-ups!) and zenning the heck out. 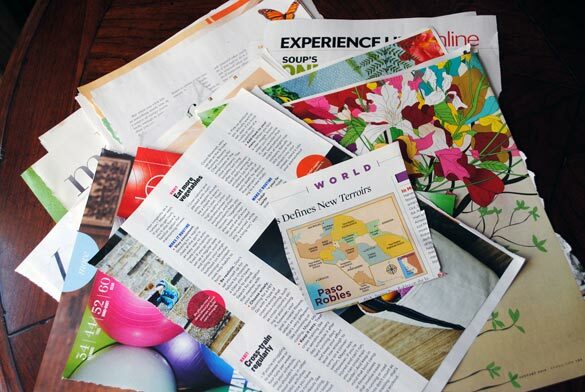 There’s good food, organization, design and inspirational phrases on everything from being fearless to finding balance to unplugging to playing. There are the “keys to success,” and even a small image tucked in with not one but two kiddos. Oh, and wine. Because, dear goodness, have I missed that. I think what’s interesting about this dream board, when I look at it as a whole, is that it feels more confident than the boards of the last few years. Like last year, it’s about where I’m going not where I’ve been, but it’s got a bit more sass to it. I’ve gone through a lot of changes and life lessons, and I think I’ve come out from it stronger — and proud. Last year was a mix of so many things and emotions, but I cannot wait for what’s to come. From the anticipation of what our little girl’s personality will be to the continued opportunities I have “working” with so many amazing women and connecting with all of you amazing readers, what’s not to love? I hang my dream board in my office, and so far, I can’t stop grinning at it. Which, for the record, is totally the point.